architecture which allows buffers to be shared by multiple input ports. circuit area of the conventional router, but achieves 164% on the TPA. 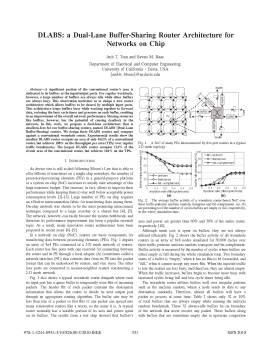 Anh T. Tran, Bevan M. Baas, "DLABS: a Dual-Lane Buffer-Sharing Router Architecture for Networks on Chip," IEEE Workshop on Signal Processing Systems (SiPS), Oct 2010, pp.331-336.